South Africa | Jasmine Suite | Rural lodging in a mountain village. Property 6: South Africa | Jasmine Suite | Rural lodging in a mountain village. South Africa | Lavender Suite | Rural lodging in a mountain village. Property 7: South Africa | Lavender Suite | Rural lodging in a mountain village. South Africa | Suite Rosmaninho | Rural lodging in a mountain village. Property 8: South Africa | Suite Rosmaninho | Rural lodging in a mountain village. South Africa | Rosemary Suite | Rural lodging in a mountain village. Property 9: South Africa | Rosemary Suite | Rural lodging in a mountain village. Memories of the Serra - House in the village, in the middle of the Sierra between granites and vegetation. Property 41: Memories of the Serra - House in the village, in the middle of the Sierra between granites and vegetation. This is a family owned and operated home with 4 wonderful private rooms with private bathrooms in the setting of a 200 year old establishment. The interior combined the yesteryear of the 1800s with refurbished antiqued up to date decorum, which matched perfectly. The exterior also appears just as it should for a quieter time of life with large vegetable gardens, long kiwi arbors, and a fantastic view of the valleys below and the small villages nestled within. 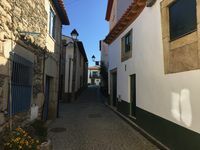 For a small fee, the gracious guardians of this priceless retreat will do your laundry and cook you authentic Portuguese meals, well prepared. The meals were excellent. I stayed here for two nights, never leaving the place because I loved it so. Stayed 4 nights and had an amazing time exploring the beautiful area.So many interesting little towns. A highlight was a private wine tour at Padrela winery (very close by).